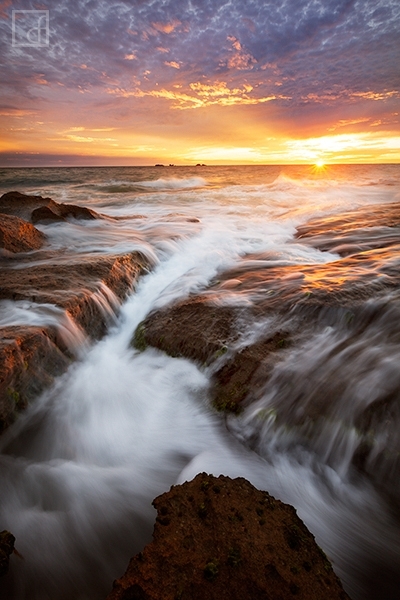 Burns Beach is one of Perth's photographic gems. The rocky coastline is spectacular when the swell and tides are matched with an exposed coastline. Pair that with spectacular light and you are in for a brilliant evening. This photograph captures a beautiful Western Australian sunset looking out over the Indian Ocean. These moment are so special to me, I absolutely admire and live for moments like this. The world momentarily changes from that harsh daylight to bright colourful light display. My previous trip here brought a first of its own. I had a small octopus latch onto my foot which was placed just to the side of a rock in a onshore rock pool. Secure your limited edition, Burns Beach photographic print, 'Glimmer', by selecting your desired print size in the menu to the right.